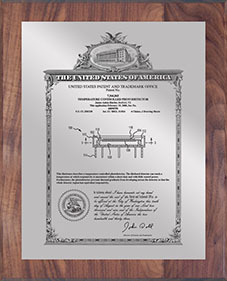 Our beautiful vintage series patent plaques feature your patent's award information inside a unique vintage-style border reproduced on the presentation plate in amazing detail. 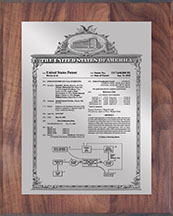 The patent plaque comes in silver or gold and is mounted on your choice of walnut, oak, cherry or black satin stain finish. Each solid wood patent display plaque is hand polished and features a keyhole on the back of the plaque for easy wall hanging. 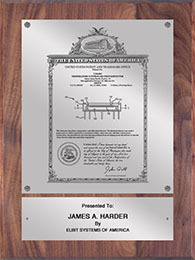 Our patent plaques are custom made to show off your hard-earned patent. 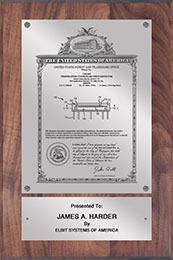 We offer many additional styles, including glass patent plaques and modern acrylic patent awards. If you don't see what you are looking for please email one of our IP Award Specialists to see how we can help you.